PopSci, the online arm of Popular Science magazine, highlights cinematic aspects in the work of the Advanced Visualization Lab. In his article, Clay Dillow, features AVL's unique combinaton of science and art. "Those productions aren’t born simply of creativity but of complex computational science, and at that intersection the AVL has found a comfortable role. 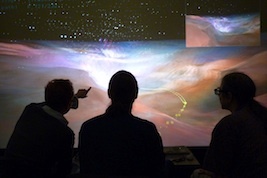 Tapping the supercomputing power at its disposal at the University of Illinois’ National Center for Supercomputing Applications (the mythical birthplace of HAL 9000), the AVL can make sense of massive data sets that others cannot, making it among the best in the world at turning complex data into science-driven cinematic art."